Download "S t a n d a r d 4. 4 a. M a n a g e m e n t o f c r e d i t r i s k. Regulations and guidelines"
4 THE FINANCIAL SUPERVISION AUTHORITY 4 Capital adequacy and risk management until further notice J. No. 1/120/ (26) 1 APPLICATION (1) This standard comprises the core principles of credit risk management as well as provisions on the establishment and maintenance of the function. 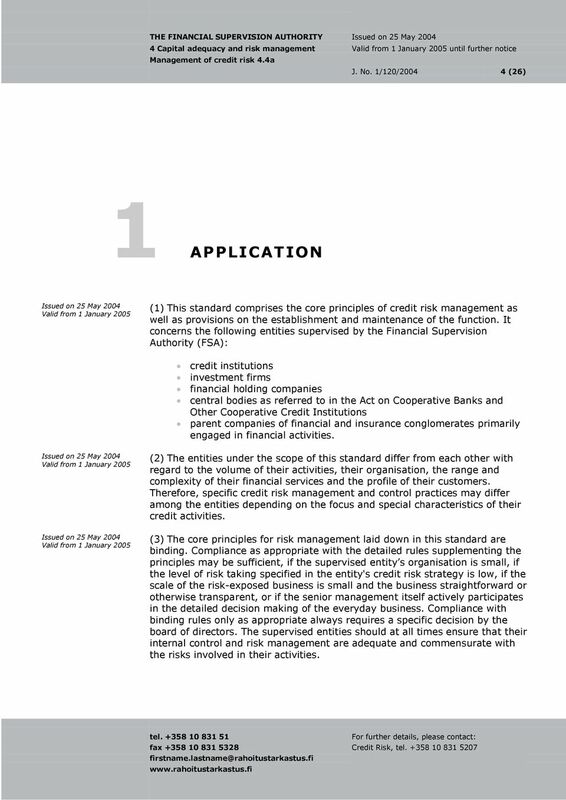 It concerns the following entities supervised by the Financial Supervision Authority (FSA): credit institutions investment firms financial holding companies central bodies as referred to in the Act on Cooperative Banks and Other Cooperative Credit Institutions parent companies of financial and insurance conglomerates primarily engaged in financial activities. (2) The entities under the scope of this standard differ from each other with regard to the volume of their activities, their organisation, the range and complexity of their financial services and the profile of their customers. Therefore, specific credit risk management and control practices may differ among the entities depending on the focus and special characteristics of their credit activities. (3) The core principles for risk management laid down in this standard are binding. Compliance as appropriate with the detailed rules supplementing the principles may be sufficient, if the supervised entity s organisation is small, if the level of risk taking specified in the entity's credit risk strategy is low, if the scale of the risk-exposed business is small and the business straightforward or otherwise transparent, or if the senior management itself actively participates in the detailed decision making of the everyday business. Compliance with binding rules only as appropriate always requires a specific decision by the board of directors. The supervised entities should at all times ensure that their internal control and risk management are adequate and commensurate with the risks involved in their activities. 5 THE FINANCIAL SUPERVISION AUTHORITY 4 Capital adequacy and risk management until further notice J. No. 1/120/ (26) (4) Entities that belong to the same consolidation group should apply uniform risk management principles. Parent companies of financial and insurance conglomerates primarily engaged in financial activities should ascertain that all companies included in the conglomerate have adequate risk management systems commensurate with their activities. In terms of credit risks taken in the conglomerate, the parent companies should also see to it that the core principles of credit risk management provided in this standard are applied throughout the conglomerate. (5) In this standard, the general expression supervised entity is used of all entities under the scope of the standard. (6) In establishing and maintaining credit risk management, the principles laid down in Standard 4.1 on the establishment and maintenance of internal control and risk management included in the section Capital adequacy and risk management of the FSA's set of regulations must also be observed. (7) In addition, the principles laid down in Standard 4.4b on management of operational risk also included in the section Capital adequacy and risk management of the FSA's set of regulations must be observed in the establishment and maintenance of credit risk management. 6 THE FINANCIAL SUPERVISION AUTHORITY 4 Capital adequacy and risk management until further notice J. No. 1/120/ (26) 2 OBJECTIVES (1) For supervised entities engaged in banking activities, credit risk is the most significant risk. However, it should be recognised that credit risk also arises in other than banking activities, ie in the form of counterparty risk. (2) Establishing and maintaining credit risk management and control as part of the internal control function constitutes a key task for the supervised entity's business management. Credit risk management and control is of crucial importance in ensuring that the supervised entity holds adequate capital against the risks involved in the business and the potential losses on incurred risks. 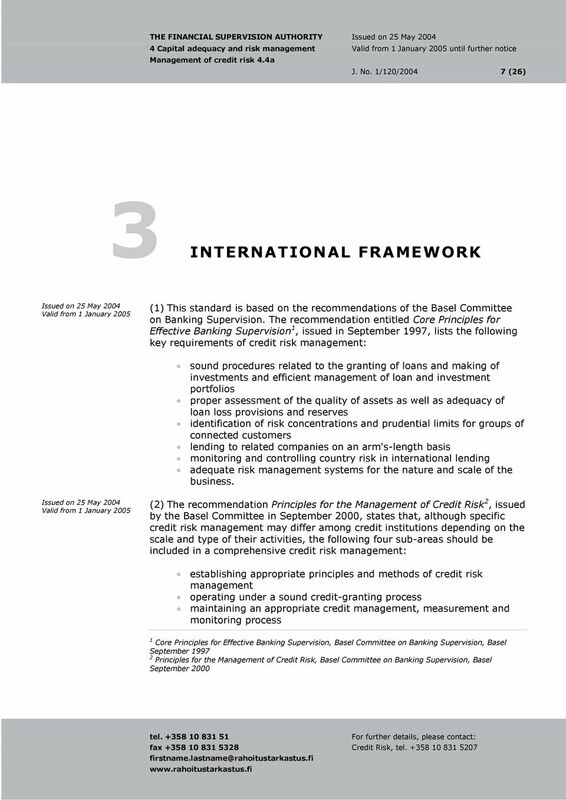 (3) The objective of the FSA's rules and regulations concerning credit risk management is to ensure that supervised entities and entities within their consolidation group have adequate and efficient functions commensurate with the nature and scale of their activities in order to identify, measure, mitigate, monitor and control credit risk as part of an overall approach to business risk management. 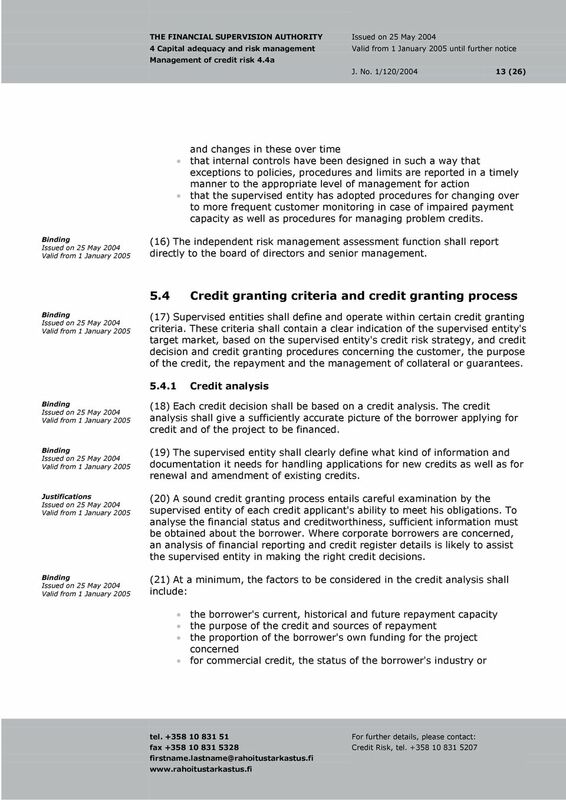 to ensure that supervised entities and entities within their consolidation group in their lending or investment activities do not take on such credit risks that may jeopardise their profitability or capital adequacy to provide information on the topics that the FSA is focusing on and the demands it places on the supervised entities. 9 THE FINANCIAL SUPERVISION AUTHORITY 4 Capital adequacy and risk management until further notice J. No. 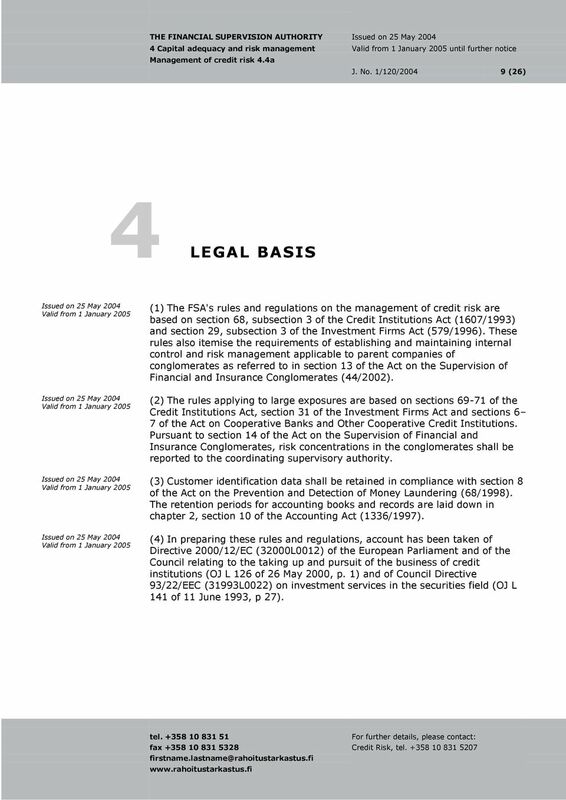 1/120/ (26) 4 LEGAL BASIS (1) The FSA's rules and regulations on the management of credit risk are based on section 68, subsection 3 of the Credit Institutions Act (1607/1993) and section 29, subsection 3 of the Investment Firms Act (579/1996). These rules also itemise the requirements of establishing and maintaining internal control and risk management applicable to parent companies of conglomerates as referred to in section 13 of the Act on the Supervision of Financial and Insurance Conglomerates (44/2002). (2) The rules applying to large exposures are based on sections of the Credit Institutions Act, section 31 of the Investment Firms Act and sections 6 7 of the Act on Cooperative Banks and Other Cooperative Credit Institutions. Pursuant to section 14 of the Act on the Supervision of Financial and Insurance Conglomerates, risk concentrations in the conglomerates shall be reported to the coordinating supervisory authority. (3) Customer identification data shall be retained in compliance with section 8 of the Act on the Prevention and Detection of Money Laundering (68/1998). The retention periods for accounting books and records are laid down in chapter 2, section 10 of the Accounting Act (1336/1997). 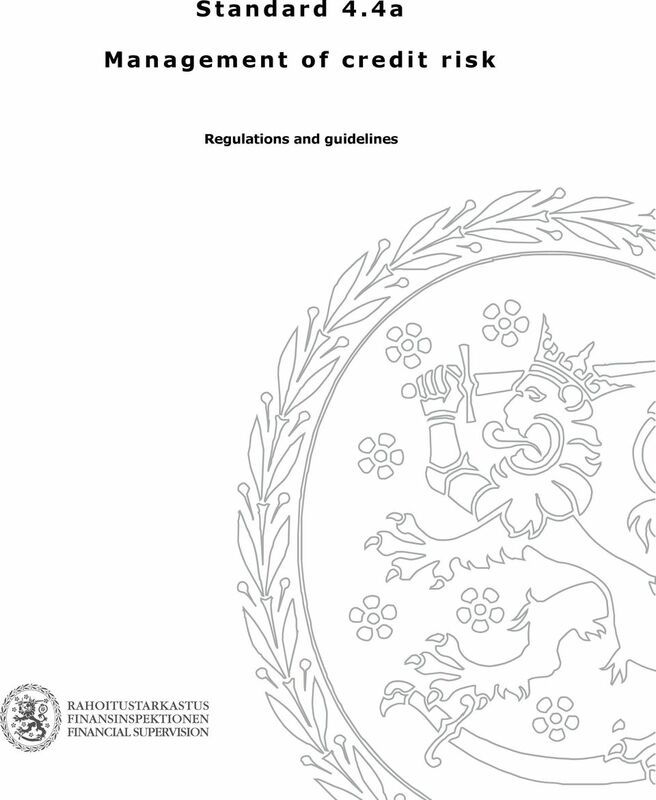 (4) In preparing these rules and regulations, account has been taken of Directive 2000/12/EC (32000L0012) of the European Parliament and of the Council relating to the taking up and pursuit of the business of credit institutions (OJ L 126 of 26 May 2000, p. 1) and of Council Directive 93/22/EEC (31993L0022) on investment services in the securities field (OJ L 141 of 11 June 1993, p 27). 11 THE FINANCIAL SUPERVISION AUTHORITY 4 Capital adequacy and risk management until further notice J. No. 1/120/ (26) credit based on exposure type, industry or economic sector, geographical location, currency and maturity target markets risk-taking level based on its risk-bearing capacity and principles for diversification of and protection against risks quality, yield and growth targets for the credit portfolio. (6) The credit risk strategy shall be reviewed periodically (at least annually). It shall also be viable in the long run and through various economic cycles. (7) The credit risk management shall cover all products and activities of the supervised entity in which credit exposure poses a risk. Supervised entities shall ensure that they have risk management procedures in place for new products and activities before these are being introduced or undertaken and that the procedures have been approved in advance by the board of directors. Special attention shall be paid to products that involve unfamiliar markets, pricing, contract law, risk management or accounting principles. 5.3 Organisation and responsibilities Board of directors responsible for establishing sound credit risk management (8) The board of directors shall have responsibility for approving and periodically reviewing the credit risk strategy and significant credit risk policies and procedures of the supervised entity. (9) The board of directors shall ensure that all relevant personnel clearly understand the credit risk strategy and significant credit risk policies and procedures approved by the board and that it observes them and the written instructions based thereon. (10) The board shall ensure that the senior management is fully capable of managing the credit granting activities conducted by the supervised entity and that those activities are performed within a risk strategy, policies and limits approved by the board. (11) The board of directors shall ensure that the supervised entity's remuneration policies do not contradict its credit strategy. 14 THE FINANCIAL SUPERVISION AUTHORITY 4 Capital adequacy and risk management until further notice J. No. 1/120/ (26) economic sector and the borrower's position within this sector as well as the business expertise of the business management commitments of groups of connected customers coverage and realisability of collateral or guarantees assessment of risks posed by macro-economic developments. (22) In their credit decisions, supervised entities need to assess the risks against expected return both in pricing individual credits and in making an overall assessment of their customer relationships. In keeping with its riskrelated goals, the supervised entity shall take into consideration potential future macro-economic changes and their effects on borrowers and contract parties. (23) Particular attention need to be paid to the identification procedures used for new customers. The identification shall be documented and filed to make it possible to establish later on how the customer relationship was formed and what information it was based on. (24) The supervised entity shall have information systems in place for the collection and updating of customer data as well as established procedures for the identification of connections between single customers, counterparties and entities related to them and the calculation of risk concentrations. (25) The supervised entity shall have information barriers between different functions, units and departments in order to prevent sensitive customer information to spread to unauthorised personnel. 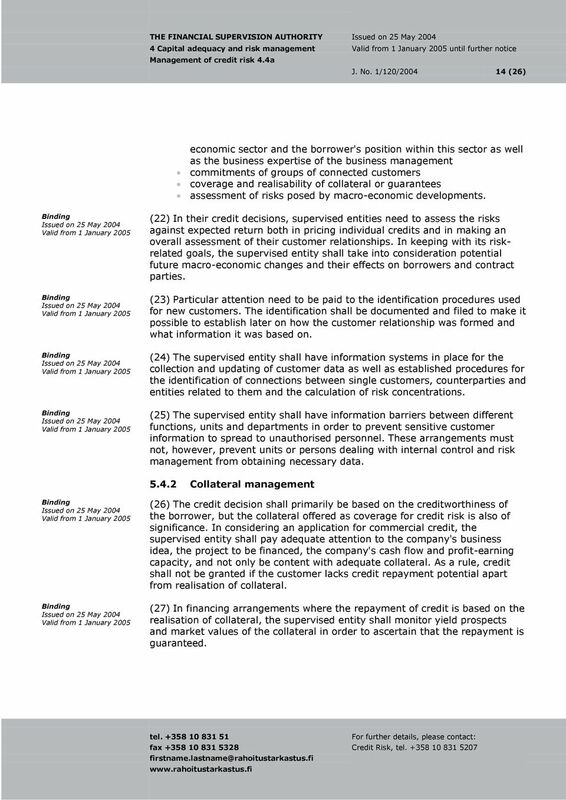 These arrangements must not, however, prevent units or persons dealing with internal control and risk management from obtaining necessary data Collateral management (26) The credit decision shall primarily be based on the creditworthiness of the borrower, but the collateral offered as coverage for credit risk is also of significance. In considering an application for commercial credit, the supervised entity shall pay adequate attention to the company's business idea, the project to be financed, the company's cash flow and profit-earning capacity, and not only be content with adequate collateral. As a rule, credit shall not be granted if the customer lacks credit repayment potential apart from realisation of collateral. (27) In financing arrangements where the repayment of credit is based on the realisation of collateral, the supervised entity shall monitor yield prospects and market values of the collateral in order to ascertain that the repayment is guaranteed. 16 THE FINANCIAL SUPERVISION AUTHORITY 4 Capital adequacy and risk management until further notice J. No. 1/120/ (26) books and records are laid down in the Accounting Act. (35) The granting of all new credit and changes of terms and conditions of credit previously granted must be provided on an arm's-length basis. All credit or comparable finance to related individuals, companies or foundations must be extended on the same terms and conditions as to non-related borrowers. The board of directors shall adopt general terms and conditions for credit to related parties and all credit extended to related parties requires the approval of the board. Justifications (36) The supervised entity shall ensure that credit is not extended to related parties at terms and conditions that could jeopardise the supervised entity's financial status or otherwise the confidence in its operations. Operating on market terms requires well-functioning markets and adequate disclosure and transparency of information. 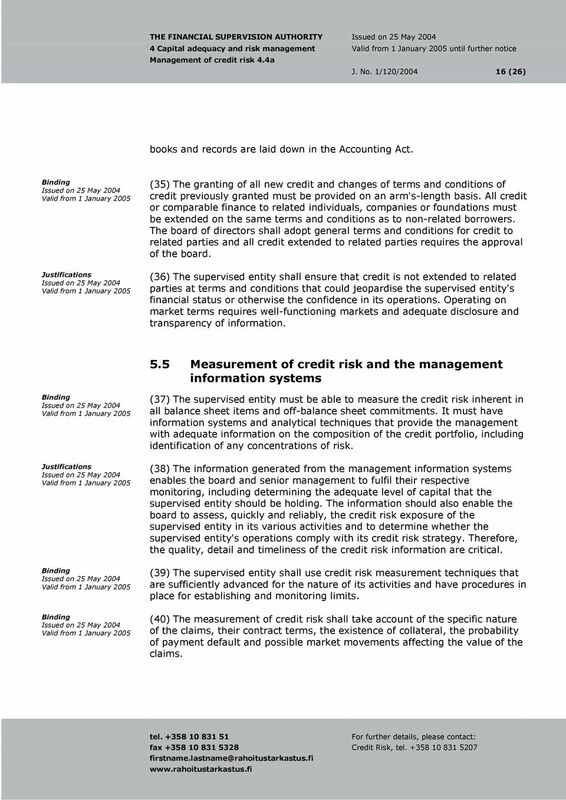 5.5 Measurement of credit risk and the management information systems (37) The supervised entity must be able to measure the credit risk inherent in all balance sheet items and off-balance sheet commitments. It must have information systems and analytical techniques that provide the management with adequate information on the composition of the credit portfolio, including identification of any concentrations of risk. 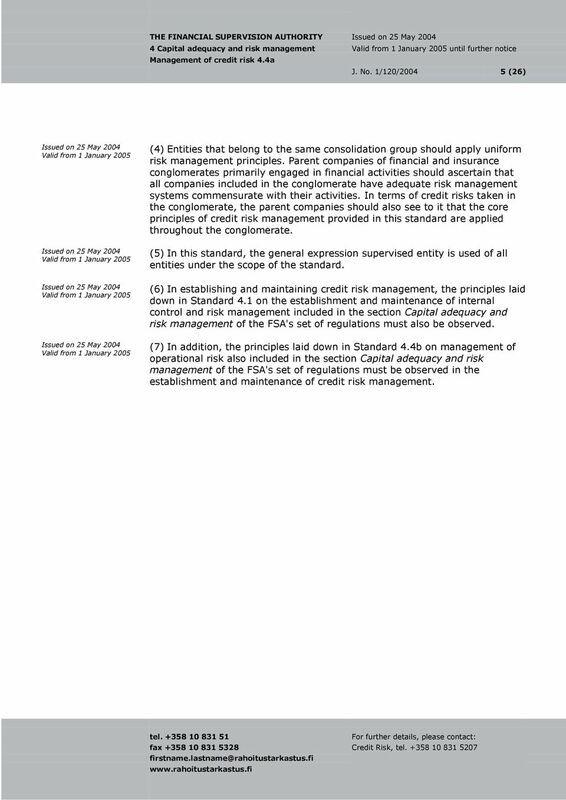 Justifications (38) The information generated from the management information systems enables the board and senior management to fulfil their respective monitoring, including determining the adequate level of capital that the supervised entity should be holding. The information should also enable the board to assess, quickly and reliably, the credit risk exposure of the supervised entity in its various activities and to determine whether the supervised entity's operations comply with its credit risk strategy. Therefore, the quality, detail and timeliness of the credit risk information are critical. 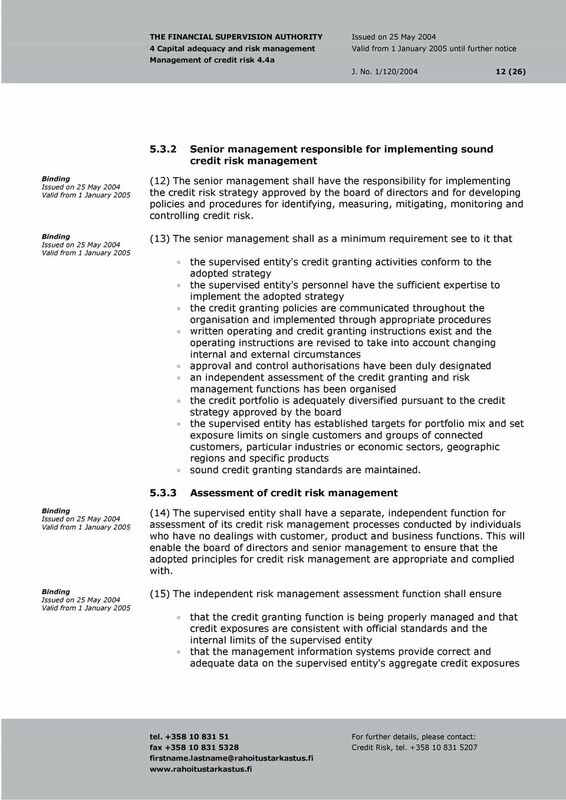 (39) The supervised entity shall use credit risk measurement techniques that are sufficiently advanced for the nature of its activities and have procedures in place for establishing and monitoring limits. (40) The measurement of credit risk shall take account of the specific nature of the claims, their contract terms, the existence of collateral, the probability of payment default and possible market movements affecting the value of the claims. 17 THE FINANCIAL SUPERVISION AUTHORITY 4 Capital adequacy and risk management until further notice J. No. 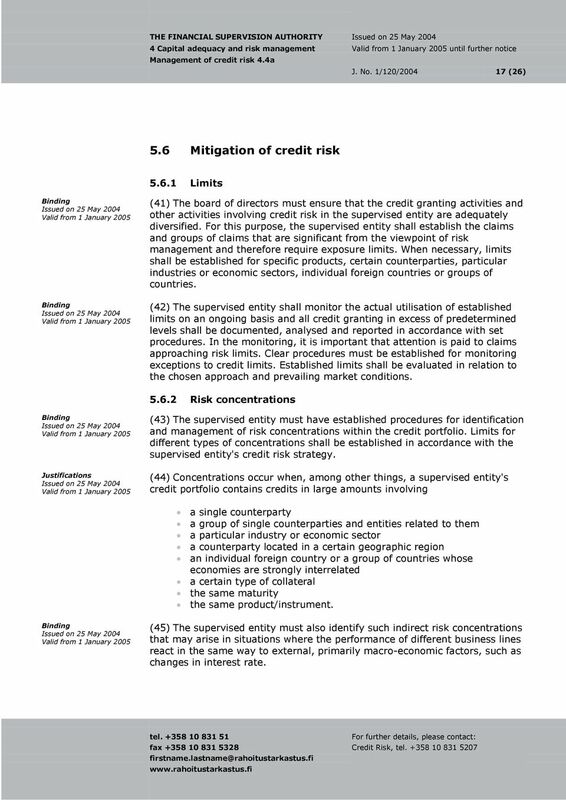 1/120/ (26) 5.6 Mitigation of credit risk Limits (41) The board of directors must ensure that the credit granting activities and other activities involving credit risk in the supervised entity are adequately diversified. For this purpose, the supervised entity shall establish the claims and groups of claims that are significant from the viewpoint of risk management and therefore require exposure limits. When necessary, limits shall be established for specific products, certain counterparties, particular industries or economic sectors, individual foreign countries or groups of countries. (42) The supervised entity shall monitor the actual utilisation of established limits on an ongoing basis and all credit granting in excess of predetermined levels shall be documented, analysed and reported in accordance with set procedures. In the monitoring, it is important that attention is paid to claims approaching risk limits. Clear procedures must be established for monitoring exceptions to credit limits. Established limits shall be evaluated in relation to the chosen approach and prevailing market conditions Risk concentrations (43) The supervised entity must have established procedures for identification and management of risk concentrations within the credit portfolio. Limits for different types of concentrations shall be established in accordance with the supervised entity's credit risk strategy. Justifications (44) Concentrations occur when, among other things, a supervised entity's credit portfolio contains credits in large amounts involving a single counterparty a group of single counterparties and entities related to them a particular industry or economic sector a counterparty located in a certain geographic region an individual foreign country or a group of countries whose economies are strongly interrelated a certain type of collateral the same maturity the same product/instrument. (45) The supervised entity must also identify such indirect risk concentrations that may arise in situations where the performance of different business lines react in the same way to external, primarily macro-economic factors, such as changes in interest rate. 18 THE FINANCIAL SUPERVISION AUTHORITY 4 Capital adequacy and risk management until further notice J. No. 1/120/ (26) (46) If the avoidance of certain risk concentrations is difficult or the concentrations are justifiable from a business point of view, the increased credit risk thus arising shall be considered in the pricing and calculation of capital adequacy. (47) In managing risk concentrations or mitigating their effects, supervised entities may use such mechanisms as loan sales, credit derivatives, securisation programmes and other arrangements in the secondary loan markets. When a supervised entity decides to utilise these mechanisms, it needs to have separate policies and procedures, as well as adequate controls, in place for identifying and managing also the risks that these mechanisms involve Large exposures Justifications (48) Risk concentrations arising from exposures to single counterparties or groups of single counterparties and entities related to them are subject to legal restrictions. 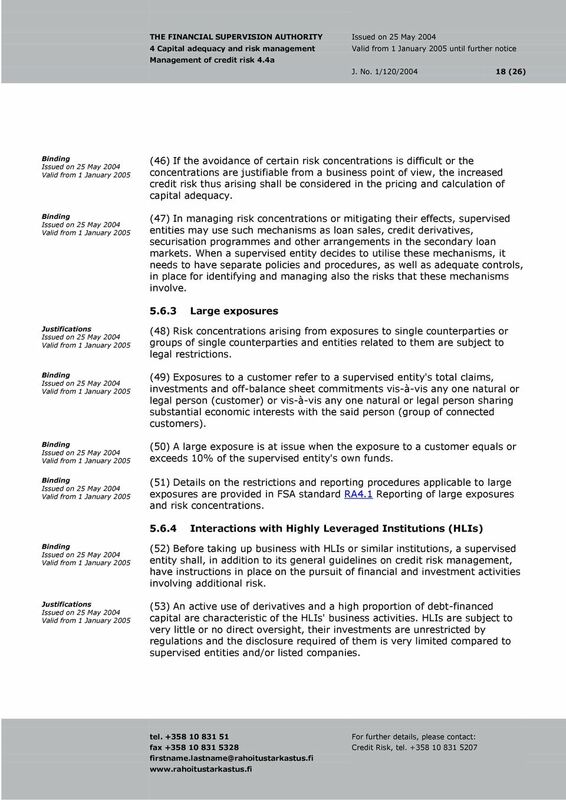 (49) Exposures to a customer refer to a supervised entity's total claims, investments and off-balance sheet commitments vis-à-vis any one natural or legal person (customer) or vis-à-vis any one natural or legal person sharing substantial economic interests with the said person (group of connected customers). (50) A large exposure is at issue when the exposure to a customer equals or exceeds 10% of the supervised entity's own funds. (51) Details on the restrictions and reporting procedures applicable to large exposures are provided in FSA standard RA4.1 Reporting of large exposures and risk concentrations Interactions with Highly Leveraged Institutions (HLIs) Justifications (52) Before taking up business with HLIs or similar institutions, a supervised entity shall, in addition to its general guidelines on credit risk management, have instructions in place on the pursuit of financial and investment activities involving additional risk. (53) An active use of derivatives and a high proportion of debt-financed capital are characteristic of the HLIs' business activities. HLIs are subject to very little or no direct oversight, their investments are unrestricted by regulations and the disclosure required of them is very limited compared to supervised entities and/or listed companies. 19 THE FINANCIAL SUPERVISION AUTHORITY 4 Capital adequacy and risk management until further notice J. No. 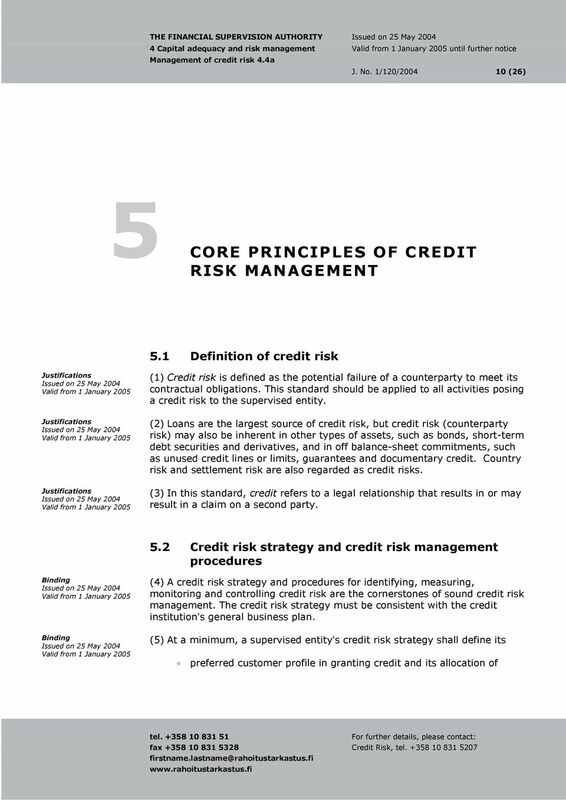 1/120/ (26) 5.7 Ongoing credit risk management and segregation of duties Credit management (54) Supervised entities shall have procedures in place for the ongoing management of their various credit risk bearing portfolios. 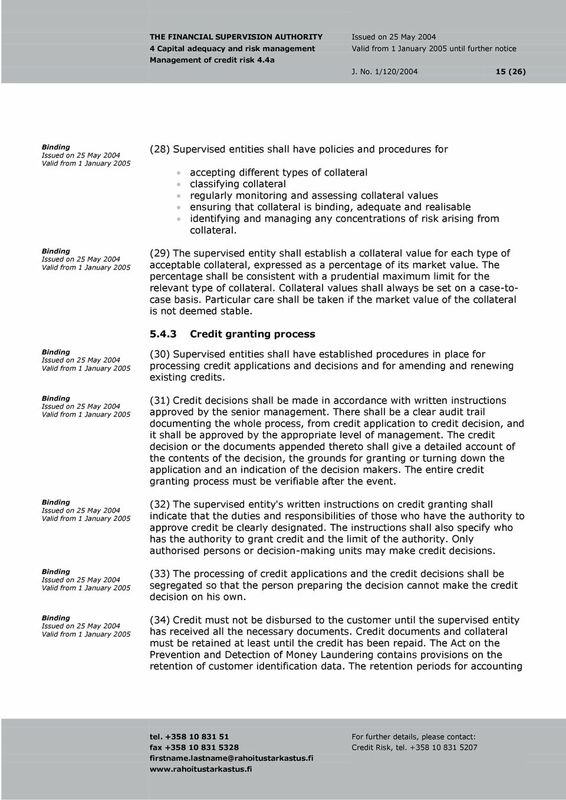 (55) A supervised entity must have an independent function, segregated from the credit granting process, to ensure that credits are granted properly and relevant documents duly prepared. The credit documents shall include information to track the history of the credit as well as information on the credit decision process, the staff involved in the credit process and credit decision and information on the current financial status of the borrower or counterparty. Justifications (56) The credit management shall fulfil the following requirements: It shall provide accurate and timely information to the management information systems. It shall ensure adequate segregation of duties and appropriate controls over back office procedures. It shall ensure compliance with policies and procedures established by the management and with applicable laws and regulations. 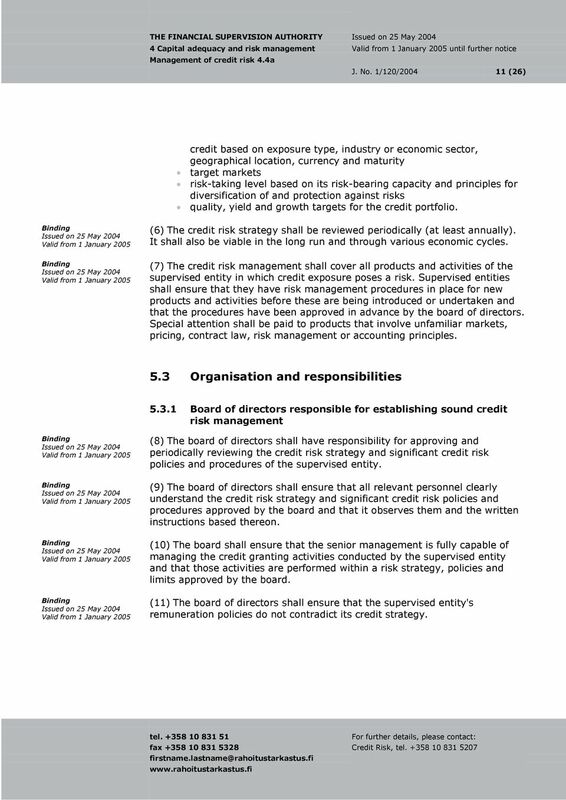 (57) The guidance and support of the board of directors is a key factor in ensuring that the credit management is recognised as a significant sub-area of the supervised entity's credit risk monitoring and control Customer monitoring (58) The supervised entity shall have procedures in place for monitoring the status of single credits and borrowers in different credit portfolios. The supervised entity shall also ensure that possible problem credits or other deteriorating business activities are detected and monitored in order to establish the need for corrective action, change of rating and/or loan loss reporting. (59) The supervised entity shall establish principles for the monitoring of customers, collateral and guarantees. The principles shall comprise separate procedures to be complied with in the monitoring of problem customers. If covenants are used in the credit granting, the supervised entity shall have capacity for the customer monitoring required. 20 THE FINANCIAL SUPERVISION AUTHORITY 4 Capital adequacy and risk management until further notice J. No. 1/120/ (26) (60) The supervised entity shall appoint the persons that are to be responsible for the monitoring of credits and collateral. These persons shall ensure that the persons responsible for the internal risk rating are provided with the updated information they need for their work. When delegating the monitoring responsibilities, the management shall consider possible conflicts of interest in situations where staff is rewarded on the basis of different criteria, such as credit volume, quality of credit portfolio or profitability Internal risk rating system Justifications (61) The board of directors shall establish procedures for differentiating various credit risks through an internal risk rating system or some other method considered sufficient by the board. 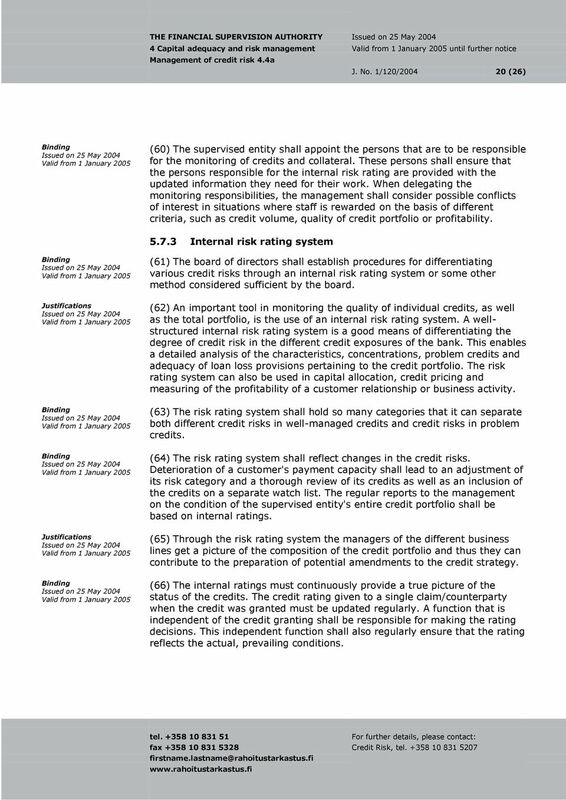 (62) An important tool in monitoring the quality of individual credits, as well as the total portfolio, is the use of an internal risk rating system. A wellstructured internal risk rating system is a good means of differentiating the degree of credit risk in the different credit exposures of the bank. This enables a detailed analysis of the characteristics, concentrations, problem credits and adequacy of loan loss provisions pertaining to the credit portfolio. The risk rating system can also be used in capital allocation, credit pricing and measuring of the profitability of a customer relationship or business activity. 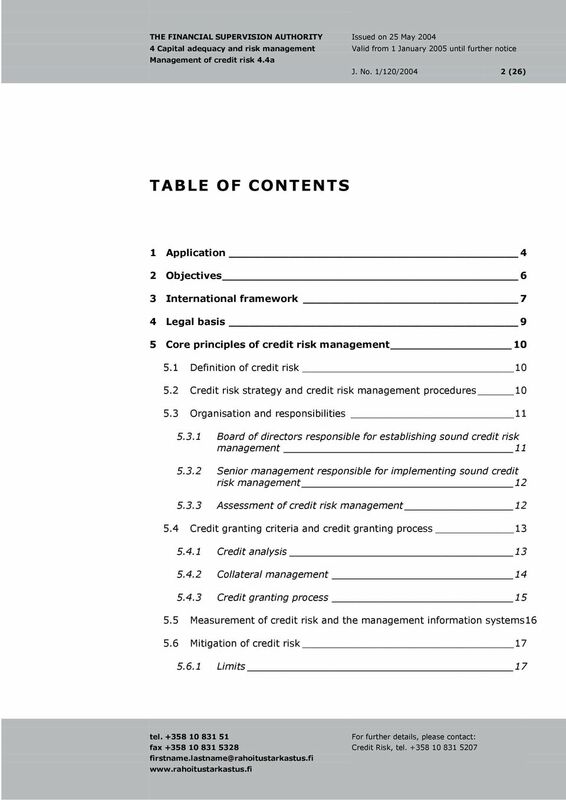 (63) The risk rating system shall hold so many categories that it can separate both different credit risks in well-managed credits and credit risks in problem credits. (64) The risk rating system shall reflect changes in the credit risks. Deterioration of a customer's payment capacity shall lead to an adjustment of its risk category and a thorough review of its credits as well as an inclusion of the credits on a separate watch list. The regular reports to the management on the condition of the supervised entity's entire credit portfolio shall be based on internal ratings. Justifications (65) Through the risk rating system the managers of the different business lines get a picture of the composition of the credit portfolio and thus they can contribute to the preparation of potential amendments to the credit strategy. 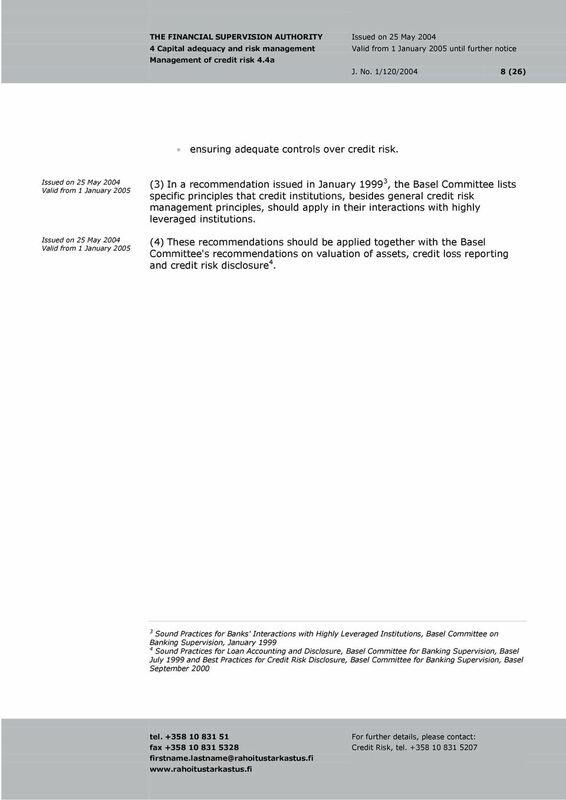 (66) The internal ratings must continuously provide a true picture of the status of the credits. The credit rating given to a single claim/counterparty when the credit was granted must be updated regularly. A function that is independent of the credit granting shall be responsible for making the rating decisions. This independent function shall also regularly ensure that the rating reflects the actual, prevailing conditions. We Beatrix, by the grace of God, Queen of the Netherlands, Princess of Orange-Nassau, etc. etc. etc. Credit Risk. Loss on default = D x E x (1-R) Where D is default percentage, E is exposure value and R is recovery rate.